This article is about infantry battlefield tactics. For uses of infiltration involving deception, see Espionage, Clandestine operation, and False flag. In warfare, infiltration tactics involve small independent light infantry forces advancing into enemy rear areas, bypassing enemy front-line strongpoints, possibly isolating them for attack by follow-up troops with heavier weapons. Soldiers take the initiative to identify enemy weak points and choose their own routes, targets, moments and methods of attack; this requires a high degree of skill and training, and can be supplemented by special equipment and weaponry to give them more local combat options. Forms of these infantry tactics were used by skirmishers and irregulars dating back to classical antiquity, but only as a defensive or secondary tactic; decisive battlefield victories were achieved by shock combat tactics with heavy infantry or heavy cavalry, typically charging en masse against the primary force of the opponent. By the time of early modern warfare, defensive firepower made this tactic increasingly costly. When trench warfare developed to its height in World War I, most such attacks were complete failures. Raiding by small groups of experienced soldiers, using stealth and cover was commonly employed and often successful, but these could not achieve decisive victory. Infiltration tactics developed slowly through World War I and early World War II, partially as a way of turning these harassing tactics into a successful offensive doctrine. At first, only special units were trained in these tactics, typified by German Stoßtruppen ('storm troops'). By the end of World War II, almost all regular ground forces of the major powers were trained and equipped to employ forms of infiltration tactics, though some would specialize in this, such as The 75th Ranger Regiment, commandos, airborne and other special forces, and forces employing irregular warfare. While a specialist tactic during World War I, infiltration tactics are now regularly fully integrated as standard part of the modern maneuver warfare, down to basic fire and movement at the squad and section level, so the term has little distinct meaning today. Infiltration tactics may not be standard in modern combat if training is low, such as for militia or rushed conscript units, or any units used in a desperation attack when an immediate victory is required. The German Volksgrenadier formations at the end of World War II, and the Japanese banzai attacks are two examples of units deployed without training for infiltration. These tactics emerged gradually during World War I. Several nations modified their existing tactics in ways that supported ideas that were later called infiltration tactics, with the German developments having the most impact, both during the war and afterwards. As far back as the 18th century, Prussian military doctrine stressed maneuver and force concentration to achieve a decisive battle (Vernichtungsschlacht). The German military searched for ways to apply this in the face of trench warfare. Captain Willy Rohr fought in the long Battle of Hartmannswillerkopf (1914–1915), starting with two Pionier (combat engineer) companies. Such engineers often employed non-standard weapons and tactics compared to the regular infantry. Rohr's initial efforts to use these as special advanced strike teams, to break French lines for following troops to exploit, achieved only limited success, with heavy losses. Rohr, working with his superiors, saw equipment improved, including the new Stahlhelm (steel helmets), ample supplies of hand grenades, flamethrowers, light mortars and machine guns. Rohr's analysis was that much more training was needed to incorporate the new weapons and to coordinate separate attacks as needed to achieve the overall operational goals. 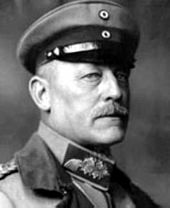 His analysis got the attention of the Oberste Heeresleitung (OHL, German army high command). In December 1915, Rohr was given the task of training the army in "modern close combat", and soon promoted to major. During the next two years, special stormtrooper detachments were created in divisions throughout the army; select men were sent to Rohr for training, who became trainers when they returned to their units. These tactics were expanded and refined by many in the German military command, extending the Prussian military doctrine down to smallest units—specially trained troops maneuvered and massed to assault positions, wherever opportunities were found. The German stormtrooper methods involve men rushing forward in small but mutually supporting groups, using whatever cover is available, and then laying down covering fire for the other groups as they moved. The tactics aim to avoid attacking any strongpoints directly, by first breaching the weakest points of the defender's line, and using those to gain positional advantages on other points. Additionally, they acknowledge the futility of managing a grand detailed plan of operations from afar, opting instead for junior officers on the spot to exercise initiative, expanding the earlier Prussian doctrine of Auftragstaktik ('mission-based tactics'). The long bombardments of World War I devastated the ground so badly that moving up reserves and materiel was difficult, allowing the defender time to regroup. Though they were far more successful than traditional attacks, they tended to bog down before a war-winning breakthrough was achieved. The Germans employed and improved infiltration tactics with increasing success, at first defensively in counterattacks as part of Germany's defence in depth and then offensively, leading up to the Battle of Caporetto against the Italians in 1917 and finally the massive German Spring Offensive in 1918 against the British and French. :489 Initial German successes were stunning; of these, Hutier's 18th Army gained more than 50 km (30 mi) in less than a week—the farthest advance in the Western Front since the Race to the Sea had ended the war of movement in 1914. (This advance would hereafter associate Hutier's name with infiltration tactics in Western Europe.) The German armies began to stall after outrunning their supply, artillery and reinforcements, which could not catch up over the shell-torn ground left ruined by Allied attacks in the Battle of the Somme in 1916; the offensives failed to achieve a war-winning breakthrough dividing the French and British armies. :137 The exhausted German forces lost the initiative and were soon pushed back in the Allied Hundred Days Offensive, ending in the German surrender. The German military did not use the term "infiltration tactics" as a distinct new manner of warfare but more as a continuous improvement to their wide array of military tactics. When the "new" German tactics made headlines in Allied nations in 1918, the French published articles on the "Hutier tactics" as they saw it; this focused more on the operational surprise of the start of the attack and the effective hurricane bombardment, rather than the low-level tactics. In post-war years, although information on "Hutier tactics" were widely distributed in France, the US and Britain, most generals were skeptical about these new tactics, given the German defeat. In Germany, infiltration tactics were integrated into the Reichswehr and the Wehrmacht. Felix Steiner, former officer of the Reichswehr, introduced the principle of stormtroopers into the formation of the Waffen-SS, in order to shape it into a new type of army using this tactic. When combined with armoured fighting vehicles and aircraft, this contributed to what would be called Blitzkrieg in the Second World War. New French tactics that included an initial step for infiltration were published by the Grand Quartier Général (GQG, French General Headquarters) on 16 April 1915, in But et conditions d’une action offensive d’ensemble ('Goal and Conditions for a General Offensive Action'), its widely circulated version being Note 5779. It states that the first waves of infantry should penetrate as far as possible and leave enemy strongpoints to be dealt with by follow-up nettoyeurs de tranchée ('trench cleaner') waves. The note covers weapons and close-combat tactics for the trench cleaners, but the tactics and weapons of preceding waves are unchanged, and there is little mention of any additional support for the now-detached advanced waves. The note contains annexes covering different subjects, including artillery, infantry defense, and infantry attacks. For attacks, Note 5779 continued to promote the pre-war French doctrine of la percée ('the breakthrough'), where an offensive is driven by a grand, single plan with continuous waves of reserves targeting the operation's distant and static objectives. It does not cover methods of adapting to local success or setbacks, nor the small-unit initiative, coordination and additional training this would require. 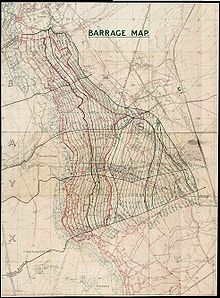 The tactics were employed with some success on the opening day of the Second Battle of Artois, 9 May 1915, by the French XXXIII Corps; they advanced 4.5 kilometres (2.8 mi) in the first hour and a half of the attack but were unable to reinforce and consolidate to hold onto all these gains against German counterattacks. The battle was costly and inconclusive, taking a heavy toll in French troops and matériel. Later French infantry tactics moved away from the costly la percée towards a more practical grignotage ('nibbling', taking in small bits) doctrine, which employed a series of smaller and more methodical operations with limited objectives; each of these were still planned at headquarters, rather than from immediate local initiative. Note 5779 also describes an early form of rolling barrage in its artillery annex; this was employed with success and continued to be developed by the French as well as by most other nations throughout the war. In August 1915, a young French infantry officer, Captain André Laffargue [fr], put forward additional ideas in a pamphlet titled Étude sur l’attaque dans la période actuelle de la guerre ('Study of the Attack in the Current Period of the War'). Laffargue based his proposals in particular on his experiences in the initially successful but ultimately disappointing results of employing the tactics of Note 5779 at the Second Battle of Artois; he commanded a company of the 153rd Infantry Regiment, attacking immediately south of Neuville-Saint-Vaast on 9 May 1915. Laffargue was left wounded on the German front line but his regiment advanced another 1.5 kilometres (0.93 mi), only to be held up by two German machine guns. Laffargue's pamphlet focused primarily on the small-unit perspective, calling for mobile firepower to deal with local resistance such as machine guns, advocating that the first waves of an attack advance through the intervals or gaps between centres of resistance, which should be temporarily neutralised on the edges by fire or heavy smoke. The points of resistance would then be encircled and dealt with by successive waves. This promotes coordinating local forces to deal with local resistance as it is encountered, an important second step in infiltration tactics. Laffargue suggests that had these methods been followed the attack could have resulted in a complete breakthrough of the German defences and the capture of Vimy Ridge. The French Army published Laffargue's pamphlet in 1915 and the following year a commercial edition found wide circulation, but as informational rather than being officially adopted by the French military. The British translated and published Laffargue's pamphlet in December 1915 and, like others, continued to make frequent use of wave attacks. The US Infantry Journal published a translation in 1916. In contrast to the infiltration tactics then under development in the German army, the tactics of Note 5779 and as expanded by Laffargue remained firmly wedded to the use of the attack by waves, despite the high casualties which could ensue. Laffargue maintained that the psychological support of the attack in line was necessary to enable men to advance against heavy fire. In 1916, captured copies of Laffargue's pamphlet were translated and distributed by the German army. How much this may have influenced German infiltration tactics is not known; such influence has been dismissed by Gudmundsson. The Germans had started developing their own infiltration tactics in the spring of 1915, months before Laffargue's pamphlet was even published. The vast Eastern Front of World War I, much less confined than the Western Front, was much less affected by trench warfare, but trench lines still tended to take hold whenever the front became static. Still, about a third of all Russian divisions remained cavalry, including Cossack divisions. Though the Brusilov Campaign impressed the German Army High Command, how this may have influenced their further development of infiltration tactics is not known. Elements of Brusilov's tactics were eventually utilized by the Red Army in developing their Deep Battle doctrine for World War II. The British Army pursued a doctrine of integrating new technologies and updating old ones to find advantages in trench warfare. At the Battle of Neuve Chapelle, March 1915, a well-planned British attack on German trenches, coordinated with short but effective artillery bombardment, achieved a local breakthrough. Though ammunition shortages and command and control issues prevented exploiting the gains, this demonstrated the importance of a combined infantry-artillery doctrine. Initial experiences in trench warfare, shared between British and French, led both to increase pre-bombardment (requiring dramatically increased artillery munitions production), and also to supply infantry with more firepower, such as light mortars, light machine guns, and rifle grenades. While the British hoped that this new combination of arms, once improved and properly executed, could achieve decisive breakthroughs, the French moved from their pre-war grand la percée doctrine to more limited and practical tactical objectives. At this same time, the Germans were learning the value of deep trenches, defense in depth, defensive artillery, and quick counter-attacks. This came to a head with the British Somme Offensive on 1 July 1916. Douglas Haig, commanding the British Expeditionary Force (BEF), planned on an ambitious large-scale quick breakthrough, with an extensive artillery bombardment targeting the German front-line defenses, followed by a creeping barrage leading a mass infantry assault. :106–10:117–21 Despite planning, execution was flawed, perhaps resulting from the rapid expansion of the British Army. The British losses on the first days were horrific. British operations improved over the next several months of the campaign, however. :113–6:183–282 Learning the limits of pre-battle planning and bombardment, they abandoned single grand objectives, and adopted a "bite and hold" doctrine (equivalent to the French grignotage) of limited, local objectives to what could be supported by available artillery in close cooperation. :345–84 Combining this with new arms was still promoted; Britain's new secret weapon, the tank, made its first appearance midway through the Somme operations. Though not yet effective, their promise of breakthroughs in the future was held out. The British Third Army employed tactics giving platoons more independence at the Battle of Arras in April 1917 (most notably the capture of Vimy Ridge by the Canadian Corps), following the reorganisation of British infantry platoons according to the new Manual SS 143. This still advocated wave attacks, taking strongpoints and consolidating before advancing, part of "bite-and-hold" tactics, but this did allow for more local flexibility, and set groundwork for low-level unit initiative, an important aspect of infiltration tactics. A new method of artillery use evolved during World War I, colloquially called "hurricane bombardment". This is a very quick but intense artillery bombardment, in contrast to the prevailing artillery tactic of long bombardments. Various forms of quick bombardments were employed at several times and places during the war, but the most successful use of hurricane bombardment was when it was combined with German infiltration tactics in which local forces take immediate advantage of any enemy weak points they find. After the start of trench warfare in World War I, and artillery moved from direct fire to indirect fire, the standard use of artillery preceding any friendly infantry attack became a very long and deliberate artillery bombardment, often lasting several days, intending to destroy the opponent's defences and kill the defenders. But trenches were very soon extended to avoid this; they were dug deeper and connected by deep or even underground passages to bunkers far behind the lines, where defenders could safely wait out bombardments. When the bombardment stopped, this signaled the start of the attack to the defenders, and they quickly moved back to their forward positions. :13–14 This practise of very long bombardments expanded over the course of the war, in hopes of at least causing a few casualties, damaging surface defenses like barbed wire lines and machine gun nests, and exhausting and demoralizing the defenders by the strain of being forced underground for so long. The Allies, led by the British, developed alternative artillery tactics utilizing shorter bombardments; these sought to achieve more success by surprise. (This was also to use limited ammunition supplies more efficiently.) The effectiveness of short bombardments was dependent on local conditions: the targets had to be precisely identified and located beforehand, a large number of artillery pieces were needed, each with ample local stockpiles of ammunition to ensure the bombardment intensity for its short duration, and all these preparations had to be kept hidden from the defenders. To further increase the chance of success, these short bombardments were followed by a series of barrages. Many variations were devised, including moving barrages, block barrages, creeping barrages, standing and box barrages. The goal of an artillery barrage is to target a line of impact points repeatedly so as to create a barrier to infantry movement; these lines can be held in position or slowly moved over time to inhibit movement by the opponent or even force them into poor positions. These barrage plans were often quite complicated and could be notably effective. The creeping barrage phase is often held out as a key part of infiltration tactics, but its use in infiltration attacks is limited by the fact that the rate of infantry advance cannot be predicted. The quickness, intensity, accuracy, and careful selection of targets for maximum effect is more important. Allied and German styles of bombardments could use tricks of irregular pauses and switching suddenly between targets for short periods of time to avoid being predictable to the defenders. Bruchmüller's hurricane bombardment tactics in close cooperation with infiltration tactics matured by the time of the German victory at Riga on 3 September 1917, where he served under General Hutier. These bombardment tactics were disseminated throughout the German Army. Hutier and Bruchmüller were transferred together to the Western Front to take part in the Spring Offensive of 1918, where Bruchmüller's artillery tactics had great effect on quickly breaking the British lines for Hutier's 18th Army. Following that initial attack, the artillery had less effect, as infantry forces advanced faster than artillery and munitions could keep up. After World War I, use of radios to quickly redirect artillery fire as needed removed any exclusive reliance on time-table driven artillery bombardment. At the Battle of Dien Bien Phu, Major Marcel Bigeard, commander of the French 6th Colonial Parachute Battalion (6th BPC), used infiltration tactics to defend the besieged garrison against Viet Minh trench warfare tactics. Bigeard's parachute assault companies were supported by concentrated artillery and air support and received help from tanks, allowing two companies (the 1st under Lieutenant René Le Page and the 2nd under Lieutenant Hervé Trapp) numbering no more than 180 men to recapture the important hilltop position of Eliane 1 from a full Viet Minh battalion, on the early morning of 10 April 1954. Other parachute battalion and company commanders also used similar tactics during the battle. ^ Hermann Cron: Geschichte des Deutschen Heeres im Weltkriege 1914–1918. Berlin 1937, p. 23. ^ a b c d Edmonds, J. E.; Davies, C. B.; Maxwell-Hyslop, R. G. B. (1995) . Military Operations France and Belgium, 1918: The German March Offensive and its Preliminaries. History of the Great War Based on Official Documents, by Direction of the Historical Section of the Committee of Imperial Defence (repr. Imperial War Museum & Battery Press ed.). London: HMSO. ISBN 978-0-89839-219-7. ^ Samuels, Martin (1992). Doctrine and Dogma German and British Infantry Tactics in the First World War. Greenwood. p. 149. ISBN 978-0-313-27959-1. ^ Citino, Robert M. (26 December 2007). The Path to Blitzkrieg: Doctrine and Training in the German Army, 1920-39. Stackpole Books. p. 16. ISBN 978-0-8117-3457-8. ^ Kraus Podcast Archived 2013-12-17 at the Wayback Machine. Kraus, Early trench tactics in the French Army, pp. 23–32. ^ Strohn, Matthias (2016). The Battle of the Somme (Companion). Osprey. pp. 204–207. ISBN 978-1-4728-1556-9. ^ a b Philpott, William. "Warfare 1914–1918". 1914–1918 Online, International Encyclopedia of the First World War. Retrieved 2 November 2017. ^ CSI Report No. 13: Tactical responses to concentrated artillery: Introduction Archived 2011-06-02 at the Wayback Machine (Combat Studies Institute, U.S. Army Command and General Staff College, Fort Leavenworth). ^ Laffargue, André (1916). Étude sur l'attaque dans la période actuelle de la guerre: Impressions et réflexions d'un commandant de compagnie [Study on the attack in the present period of the war: Impressions and reflections of a company commander] (in French). Paris, France: Plon-Nourrit et Cie.
^ CDS 333 "A Study of the Attack in the Present Phase of War: Impressions and Reflections of a Company Commander" (December 1915). Microsoft Word. ^ Laffargue, André (1916). "Study on the attack in the present period of the war: Impressions and reflections of a company commander". Infantry Journal. 13 (2): 101–138. ^ Jones, "Infiltration by Close Order"
^ Gudmundsson, Stormtroop Tactics, pp. 193–196. ^ Dowling, Timothy C. (8 October 2014). "Eastern Front". 1914-1918 Online. Retrieved 20 November 2017. ^ Ėmmanuelʹ, V. A. (2013). The Russian Imperial Cavalry in 1914 (First Winged Hussar Publishing ed.). Point Pleasant, NJ: Winged Hussar Publishing LLC. ISBN 978-0988953215. ^ Simkin, John (May 2015). "Russian Army and the First World War". Spartacus Educational. Retrieved 20 November 2017. ^ a b c d e Tunstall, Graydon A. (26 February 2008). "Austria-Hungary and the Brusilov Offensive of 1916". The Historian. 70 (1): 30–53. doi:10.1111/j.1540-6563.2008.00202.x. ^ Brusilov, A. A. (1983). My Memories. Military Publishing House. pp. 194–197. ^ Edmonds, J. E.; Davies, C. B.; Maxwell-Hyslop, R. G. B. (1935). 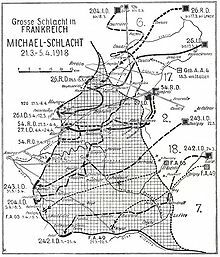 Military Operations France and Belgium, 1918: The German March Offensive and its Preliminaries. History of the Great War Based on Official Documents, by Direction of the Historical Section of the Committee of Imperial Defence (Imperial War Museum & Battery Press ed.). London: HMSO. p. 489. ISBN 978-0-89839-219-7. ^ "Brusilov's breakthrough is the forerunner of remarkable breakthroughs, carried out by the Red Army in the Great Patriotic War." - M. Galaktionov, Preface to «Моим воспоминаниям» ('My Recolections'), Aleksei Brusilov, republished 1946. ^ Griffith, Paddy (1994). Battle Tactics of the Western Front: the British Army's Art of Attack, 1916-18. London: Yale University Press. p. 110. ISBN 978-0300066630. ^ Sheffield, Gary David (2011). The chief: Douglas Haig and the British Army. London: Aurum. pp. 110–111. ISBN 978-1-84513-691-8. ^ Philpott, William. "Warfare 1914-1918". International Encyclopedia of the First World War (WW1). Tactical Systems Emerge. Retrieved 6 December 2017. ^ a b c Philpott, William (2010). Bloody victory: the sacrifice on the Somme and the making of the twentieth century (Pbk. ed.). London: Abacus. ISBN 9780349120041. ^ Sheffield, Gary (2004). The Somme (Pbk. ed.). London: Cassell. pp. 112–124. ISBN 978-0-304-36649-1. ^ "Instructions for the training of platoons for offensive action, 1917". Internet Archive. Retrieved 7 October 2017. ^ Kaufmann, J.E. ; Kaufmann, H.W. (8 July 2016). "Notes". Verdun 1916: The Renaissance of the Fortress. Pen and Sword. ISBN 978-1-4738-2702-8. ^ a b Zabecki, David T (1994). 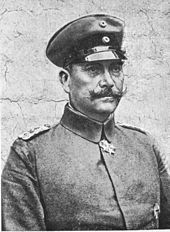 Steel Wind: Colonel Georg Bruchmuller and the Birth of Modern Artillery. Praeger. ISBN 978-0-275-94749-1. ^ Evans, Nigel F. "FIRE PLANNING". BRITISH ARTILLERY IN WORLD WAR 2. Retrieved 4 November 2017. ^ Tucker, Spencer (1 March 1999). "Artillery". European Powers in the First World War: An Encyclopedia (1st ed.). Routledge. ISBN 978-0-8153-3351-7. ^ Davidson, Vietnam at War, p. 265. Davidson, Phillip B. Vietnam at War: The History, 1946–1975. New York: Oxford University Press, 1991. ISBN 0-19-506792-4, ISBN 0-89141-306-5. Gudmundsson, Bruce I. Stormtroop Tactics: Innovation in the German Army, 1914–1918. New York: Praeger, 1989. ISBN 0-275-93328-8. Simon Jones, Infiltration by Close Order: André Laffargue and the Attack of 9 May 1915. Kraus, Jonathan. Early Trench Tactics in the French Army: The Second Battle of Artois May–June 1915. Farnham: Ashgate, 2013. ISBN 978-1-4094-5500-4. Kraus, Jonathan. Podcast: The Second Battle of Artois, May 1915: the new turning-point. Laffargue, André. The Attack in Trench Warfare Impressions and Reflections of a Company Commander by Capt. André Laffargue 153rd Infantry, French Army, Translated for the Infantry Journal by an Officer of Infantry. Washington, D.C.: The United States Infantry Association, 1916. Samuels, Martin. Doctrine and Dogma: German and British Infantry Tactics in the First World War. New York: Greenwood Press, 1992. ISBN 0-313-27959-4. Samuels, Martin. Command or Control? : Command, Training, and Tactics in the British and German Armies, 1888–1918. London; Portland, Oregon: Frank Cass, 1995. ISBN 0-7146-4570-2, ISBN 0-7146-4214-2. House, Jonathan M. Toward Combined Arms Warfare: A Survey of 20th-Century Tactics, Doctrine, and Organization. U.S. Army Command General Staff College, 1984. Available online (8 September 2016) or through University Press of the Pacific (Honolulu, Hawaii, 2002). ISBN 1-4102-0159-7. Pope, Stephen, Elizabeth-Anne Wheal, and Keith Robbins, eds. The Macmillan Dictionary of the First World War. London: Macmillan Reference Books, 1995. ISBN 0-333-61822-X.